For this essay, I picked a movie that was still in theaters and analyzed it in terms of genre. Specifically, I determined how I would classify the film, and why exactly I came to that conclusion. I chose to write about Michael Haneke’s Amour. Prior exposure to the director of Amour also helped shape my expectation that I was about to see a drama; I felt Caché and The White Ribbon, two of Haneke’s most recent films, fell within the bounds of the drama genre. Based on the fact that the film’s title translates to “love,” and the solemn, weathered look of Emmanuelle Riva’s face and Jean-Louis Trintignant’s hands in the poster, I also believed that Amour was undoubtedly a deeply sentimental romantic film. Indeed, my experience with the film generally corroborated my assumption that it was a romantic drama. 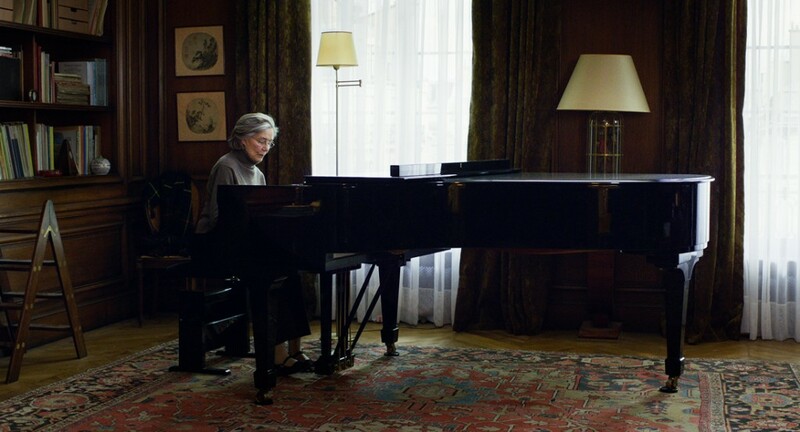 Michael Haneke’s Amour tells the story a married couple, two retired musicians, who are struggling with the difficulties of old age. While the film introduces the two in relatively good health as they attend a piano recital of a former student, Georges (Trintignant) starts to notice that Anne (Riva) is unwell; her memory is fading and her motor functions are deteriorating. Despite all of this, Georges stays at Anne’s side and attends to her every need as her condition gets worse and worse. At this point in the film, I was reasonably sure that the movie was a romance film; the relationship between the two leads was well-developed and had been given precedence despite the growing specter of death looming in the background of the plot. As aforementioned, I believed going into Amour that the movie could be classified as what I called a “romantic drama.” But film scholar Catherine Preston, romantic dramas are more typically focused on forming relationships between the protagonists and the struggles resulting from that process. While elements of this idea certainly appear in Amour in the first few scenes and then later as Georges contemplates how best to deal with his wife’s sickness, Amour features no unrequited or forbidden love preventing the protagonists from getting together. Rather, Anne and Georges are happily married, and their struggle is with Anne’s health as opposed to conflict with one another. Despite the fact that the “romantic drama” moniker didn’t seem to apply in its entirely, though, I believed that romance was still a significant aspect of the movie. 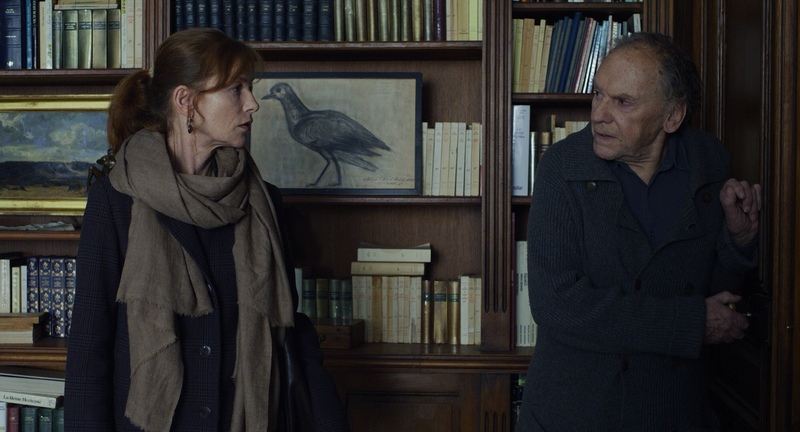 As the film progressed, I was convinced that the film was definitely a drama because of how it realistically focused on often-ignored social issues; in this case, Haneke chose to bring attention to aging and its accompanying ailments. However, drama is a very broad category that encompasses many different kinds of film. Therefore, after watching the movie, I began to look at drama sub-genres to classify Amour more accurately. One of these smaller categories was the melodrama, films which writer Tim Dirks says use “tragedy, illness, neuroses, or emotional and physical hardship within everyday life” to make the audience cry. Yet, despite the apparently congruent description of melodrama with what I experienced watching Amour, I would hesitate to put the movie in that corpus, or body of films. Melodrama is a genre term which also has a negative connotation; colloquially, melodrama refers to overly-emotional and exaggerated behavior. In the critical world, melodrama is seen negatively and is often perceived as overwrought and manufactured with the simple goal of making their target audience, usually women, react to the movie by empathizing with the protagonist and crying at the more emotional points of the film. When I saw Amour with my girlfriend, our experience did not mirror these criteria – neither of us cried or reacted to the film in the way one would expect from a melodrama, and neither of us felt that the emotional pull of the film was in any way cloying or artificial. Moreover, melodrama is semantically associated with music (melos means “music” in Greek). 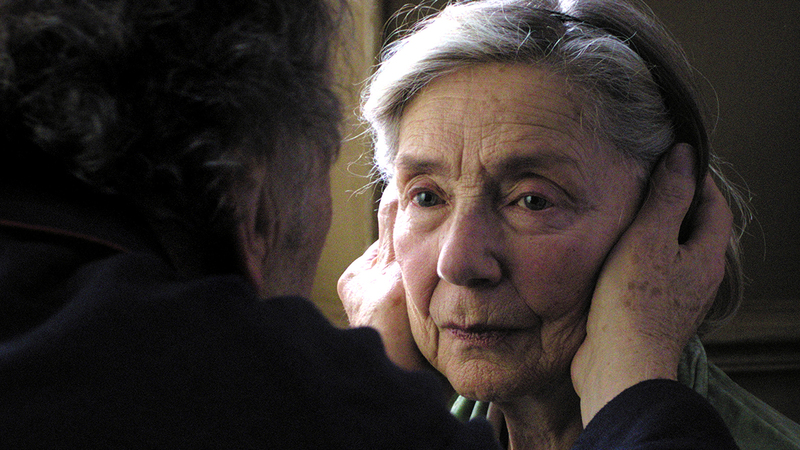 In Amour, there is a distinctly minimalist soundtrack. Apart from the music played during the opening scene at the piano recital and a brief montage later on in the film, music does not seem to play a big role in the movie as a mode of inducing an emotional response. Instead, music is used as exposition: initially to show the interest Georges and Anne have in music, and later to show of Anne’s talent at teaching and playing the piano. While use of music later in the film does come at a point when Anne’s death is clearly imminent, the emotional semantic effect seems secondary to the syntax of the plot as Georges makes his final decision about how to handle her passing. In Tim Dirks’ definition of melodrama, the he mentions the word “tragedy.” Though his broader definition of melodrama seems to be an ill-fit for Amour, that word in particular struck me as I thought about the film’s narrative structure. The climax of the story is the pivotal moment when Georges suddenly smothers Anne in her bed, finally releasing her from her agonizing bedridden state. From the moment we find out that Anne is ill, we can infer from her symptoms that her illness is likely terminal and as a result spend the whole film expecting her imminent death. 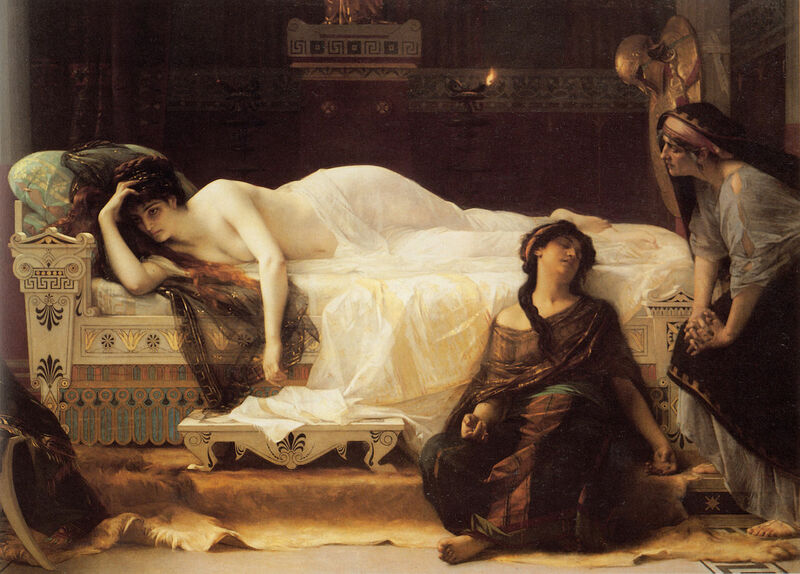 To me, this seemed to echo the syntactic nature of many other tragedies; from Jean Racine’s Phèdre to William Shakespeare’s Hamlet, the doomed protagonist is a fairly typical hallmark of the genre. Tragedy, though, is often reserved for stories about character of societal import. In Phèdre, the title character is descended from the god Helios. In Hamlet, the protagonist is the prince of Denmark. Amour, conversely, focuses on two unremarkable elderly people; the fact that they are elderly means they fill an even lower niche because modern society neglects its members once they reach the age of retirement. 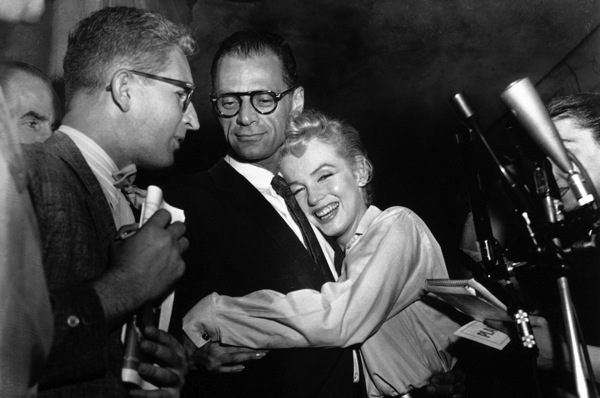 To counter this trend of tragedies focusing on so-called important characters, in his 1949 essay “Tragedy and the Common Man” about the need to bring tragedy back into the mainstream, playwright Arthur Miller discusses the changing nature of the genre. He states: “It is time, I think, that we who are without kings, took up this bright thread of our history and followed it to the only place it can possibly lead in our time – the heart and spirit of the average man.” The idea of elevating the common man to the leading man is one that we can observe directly in his plays, including Death of a Salesman, and it is a cross-media intertextual re-imagining of the genre of tragedy that I believe befits a film like Amour. In the same essay, Miller also directly challenges the notion that tragic protagonists have to be devoid of hope from the onset. He suggests that this view is “the mode for a pessimist,” which is borne from misguided assertion that “…tragedy is of necessity allied to pessimism.” He offers instead that tragedy only succeeds when the potential for success is clear to the audience, so that the audience believes the protagonist may yet escape from their impending doom. I would argue that this looser set of criteria for the tragedy schema is not only an astute analysis of the genre in plays, but is also applicable to movies like Amour qualifying for the the would-be generic corpus of tragedy filmmaking. There is one scene in Amour which seems to have very little in common with romantic films, dramas, melodramas, or tragedies, however. It comes in a surreal sequence where Georges hears a noise while shaving and decides to leave the apartment still dressed in his pajamas. Georges then realizes he is standing in water, leaving the audience confused. Suddenly, a hand comes up from behind him and grabs him around the mouth, shocking the viewer with a jump-scare. Shortly thereafter, the whole event is revealed to have been a dream. Earlier in the film, Haneke gives the audience reason to believe that there had been an attempted burglary at their home. Furthermore, two of Michael Haneke’s previous films had strong thriller elements. Therefore, when Georges begins to walk outside his front door and down a hallway, tension is high; as an audience, we feel that a potential genre shift into a hybrid drama-thriller is possible. But no subsequent scenes follow the frightening tone of this dream, and the shift in genre never happens. As an amateur critic, I wondered what the value or purpose of this scene was. However, because it did not seem to fit with any of the other genre schema in the film, I came to the conclusion that this was merely a directorial motif that Haneke wanted to keep consistent with other movies in his œuvre, and not an attempt to confuse audiences on how to classify Amour. While genre is an imperfect way to describe film, a well-reasoned classification of a movie can help honestly alter audience expectations. With that in mind, I believe that Amour is best described not as a romantic drama, nor as a romantic melodrama, but as a “romantic tragedy.” Certainly the theme of commitment to and sacrifice for loved ones is a major component of the story, placing it well-within the realm of romantic filmmaking. As the audience hopes for Anne’s recovery, they can see that her strokes are mortally affecting her mental and physical capabilities more and more every day – lending credence to the film as a modern tragedy, as well.